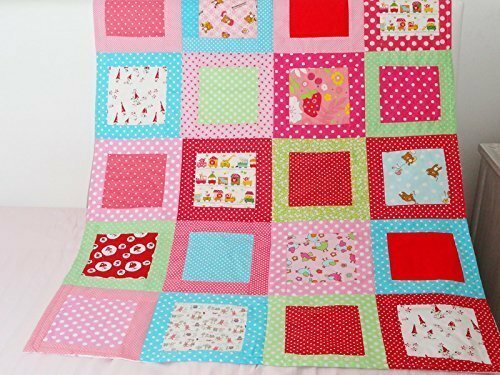 Handmade traditional quilt for sale, polka dot blanket, nursery bedding. Two sided receiving blanket, handmade of high quality cotton fabrics. every square tell a little story. This special blanket is backed with white and hearts print cotton. . THIS BLANKET IS ONE OF A KIND DESIGN! All of my quilts are one of a kind design. You will not find two quilt that are the same, I use different fabrics on every blanket. This why my quilts are perfect for a gift. It's light and airy, soft and cozy, great as a baby-shower gift for a girl, or for your own little one! The blanket size is app. 37"X45" / 94cmx115cm. The blanket was made in a pet and smoke-free environment. It was washed after I finished making it. Cleaning the quilt is easy! Wash in cold water, gentle cycle, air dry. It will be send wrapped beautifully in cellophane. If you have any questions about this product by sweetandcozy, contact us by completing and submitting the form below. If you are looking for a specif part number, please include it with your message.